This is a long-term passive income opportunity based on real sales of amazing and unique products that will have a lot of purchase volume. Fund as many project as you want with $149 or $299 and earn the same amount every month for 3 or 5 years. The more project you fund the more you earn. Your earning come from real sales made by the biggest reseller in the world such as Amazon. Percentage of the royalties that your referrals earn from the sales! 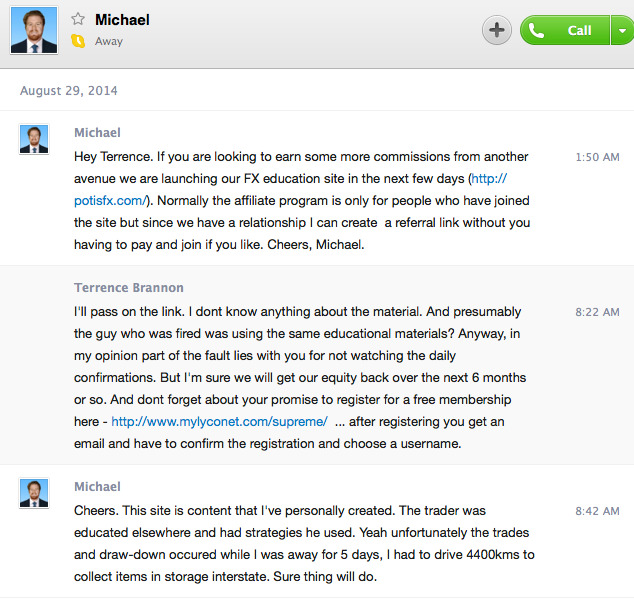 I was a skype friend of Michael Murrihy, founder and owner of Copy Our Trades. He traded successfully for 6 months in beta testing. And he did very well in the first few months of me working with him. I did notice that he was using a variation of Martingale called d’Alembert. And I noticed that he did not put stop losses on his trades, saying that he used a combination of hedging and manual stops instead. Well, unfortunately, I gained a lot of confidence in him and deposited a total of $7,000 into the account. Around August 8, the drawdown on the account was around 25-30% – much larger than before. When I wrote to Michael, I got no response. It turned out that he had left town for personal reasons and had not been monitoring the account. A trader trading the Master Account made some mistakes. Michael fired him, although we have to ask whose fault it was? Michael was not monitoring the account. Unfortunately , the GBPUSD did not retrace and keep falling more and more. 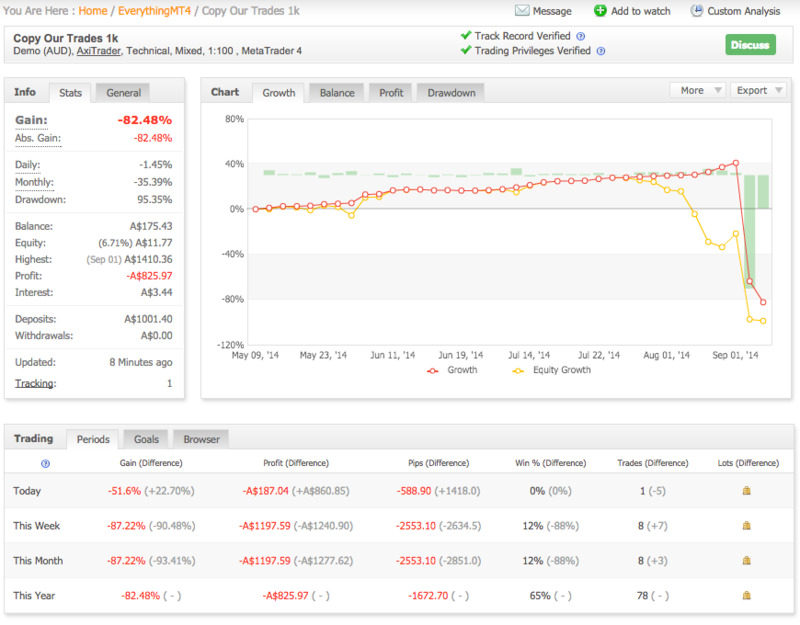 My account was well over 80% drawdown at this point, and still no trades were closed on their end. The first order of business is to own your home – you pay so much for rent each month and it is still a expense and a debit not an asset and a credit. You have lost over 10k in forex – that’s a down payment on an income producing property! Never let the account drawdown more than 40%. If it does, get out. In other words have your exit strategies setup. Never trade with anyone who does not have 1 year of documented track record. It was odd how he attacked other traders for not using stop losses and grid-style trading.. .and thne it turns out that he did the same thing! It’s important to delegate tasks to the right person: have the secretary type the letter, have the salesman do the sales. But maybe I delegated the task to the wrong person or should have learned it myself? I dont know. MOST IMPORTANT: start small and PATIENTLY COMPOUND – dont charge in with money you dont want to see up in smoke and hope for big gains in the next week or month! An 8,000 dollar account now have $170.00 in it… that’s right 90% of the money is GONE! 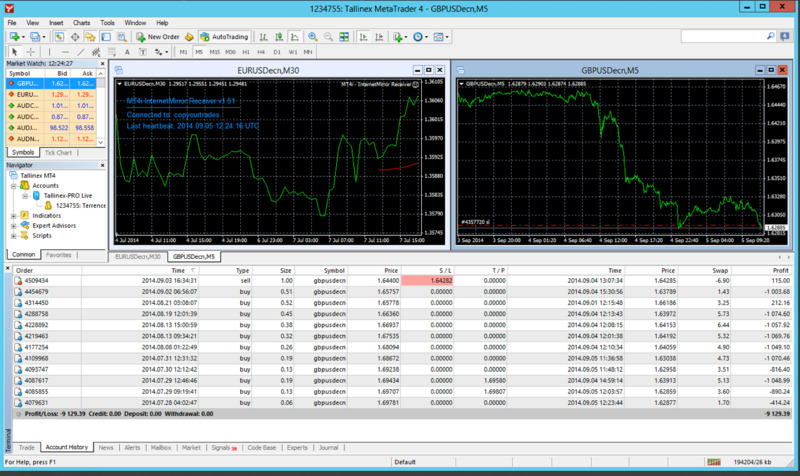 $546 profit booked at Copy Our Trades. 10-20% monthly on autopilot is their moniker and they delivered once again as you can see. – Smart Mart booked a small profit on what was left after I moved his capital to Copy Our Trades. He will do fine next month. with the 1k that he now has. Super Signals lost so I moved his money over to Smart Mart. ConnectForex blew my account by sending false signals. So much for working with them! Very promising, my friend on Skype is offering Binary Options signals with a high success rate! 22:57 Please wait and one of our operators will be with you shortly. 22:58 Nick Mcdonald: Hi, how can I help? 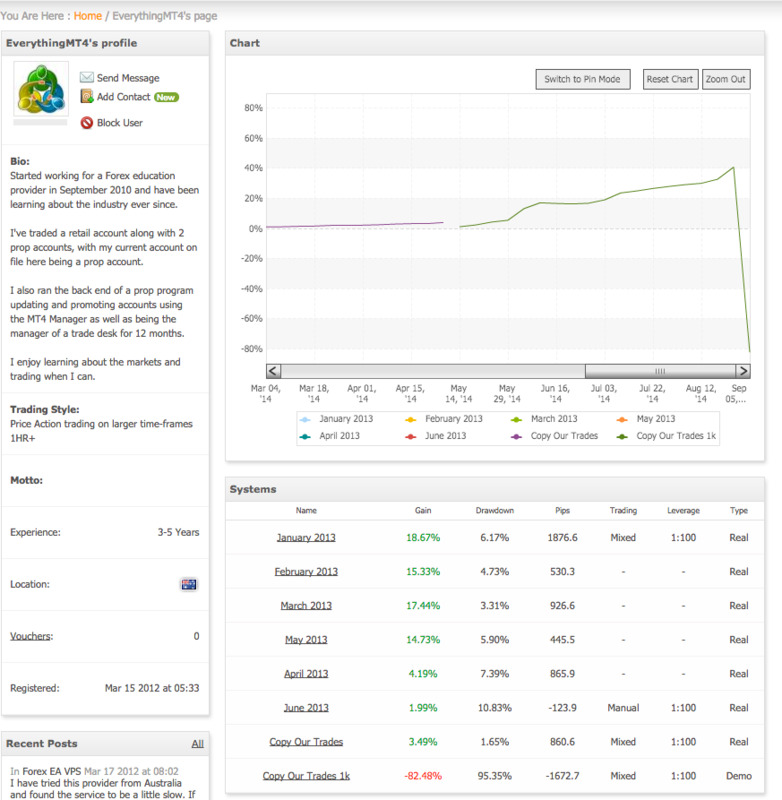 22:58 Visitor: My userid is 12457 … a lot of trades that were closed by the trader have not been closed in my account. 22:58 Visitor: some were closed as long as a week ago. 22:59 Visitor: you mean what is the EA saying? 23:02 Nick Mcdonald: how many trades have you got open in total? 23:04 Nick Mcdonald: are you using our VPS? 23:04 Nick Mcdonald: how is your account connected? 23:04 Nick Mcdonald: Do you have teamviewer? 23:07 Visitor: I think one thing is that I changed the Equity Risk to 2.0 and maybe it tried to double the trades and did not close some? 23:09 Nick Mcdonald: Sorry, give me a few mins. 23:11 Nick Mcdonald: I’ve never seen this issue before, but I’m hoping that will fix it. 23:11 Nick Mcdonald: because you’re using an older version. 23:12 Visitor: what about this huge drawdown I’m experiencing? 23:13 Nick Mcdonald: I’ve never seen this happen before. So all we can do is try and ensure it doesn’t happen to you again. 23:14 Visitor: So you arent going to refund the losses I experienced because of your signal system? 23:14 Nick Mcdonald: Unfortunately we don’t take any responsibility for losses incurred as a result of the trade copier. We try and provide you with the most reliable system possible, however occasionally issues will happen that may result in losses. $257 profit booked at Copy Our Trades. 10-20% monthly on autopilot is their moniker and they delivered once again as you can see. – Smart Mart booked $73 profit on a 1k account (7% gain). 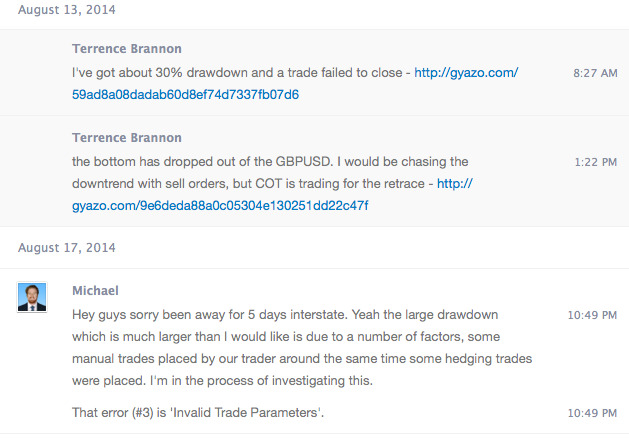 SignalTrader only produced 1% for the month on a 5k account, so forget them. ConnectForex has excellent money managers and a powerful easy-to-use interface. They also have in-house VPS service (but since I can get an account at Interserver for 3 times less, I will pass). I will have glowing reports on them next month! $154 profit booked at Copy Our Trades. 10-20% monthly on autopilot is their moniker and they delivered once again as you can see. $11 profit booked on a 1k account at Tallinex with Smart Mart, showing why she remains the #1 trader. My new forex endeavor will be SignalTrader. First create an account at myfxbook. This will automatically start the download of the EA installer. Run the installer and follow these instructions. WCM is the umbrella for a HUGE set of operations internationally. WCM777 is just one of them. Here I keep track of everything that Phil Ming Xu is doing. Goldline International – buy your refs! What I like about Goldline International is that 25% of the monthly web traffic comes from people who were not sponsored. They allow you to buy these people on a monthly basis to build your business. They call it taking a business set. Here is my referral link so you can get started. 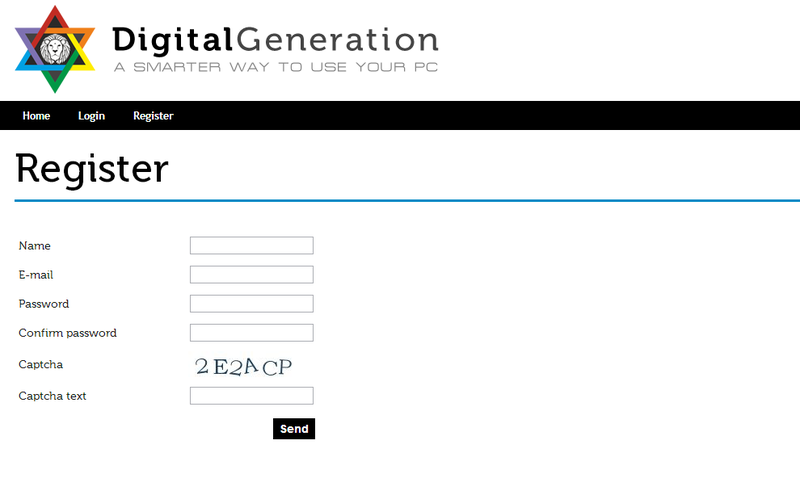 Digital generation is a smart desktop software that pays regular users like you and me to use a litle bit of your computer’s spare processing power. The deal is simple: academic and company research, statistical analysis and other activities like these often demand large data processing which until now is being performed by supercomputers. It happens that supercomputers are extremely expensive, so a group of people came up with a solution: digital generation. It simply takes advantages of all personal computers connected to the internet that have subscribed the service and divides the large set of data by all of them. Well, this is good by itself but the great news is that you they pay you the amount of time your pc’s in use! Just think how many hours do you spend on your pc. Now you can convert that time into money: 1$ or more per day. And you can’t even feel slowness on your pc at all. Go to coingeneration.com and sign up. Login and navigate to personal -> profile. 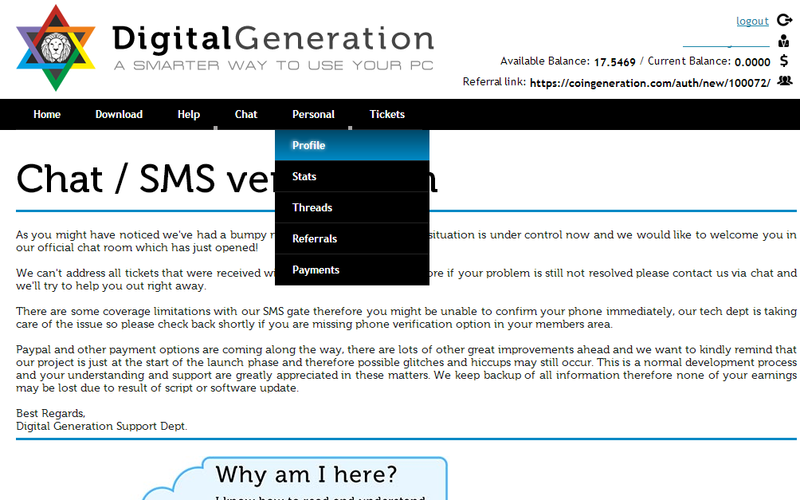 Insert your phone number in the text box to verify your account and you will receive a text message with a code. 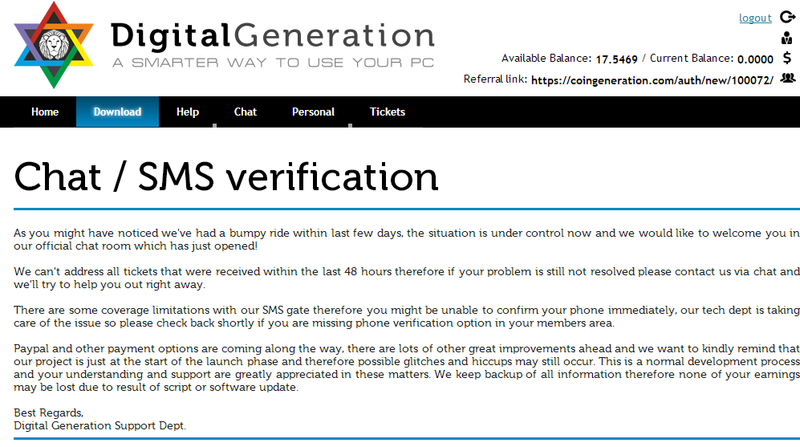 Retrieve the text message with the code and wait for verification. Mine says “successfull verification” because it’s already verified. Download the desktop software by clicking in the Download button. Install the software by double clincking the downloaded file and that’s it! Everything’s up and running! The standard package is 30$ per month but you can earn more by investing in more threads (this might seem complicated to understand but it means that you earn money depending on how many threads they are “borrowing” from your computer. More threads imply more processing power). But don’t bother with this for now. You can also invite your friends by passing them your referral link (top right). You earn 20% of your first level referrals and 10% of your second level referrals. Confused? It’s like this: If you invite John and john invites Helen, you earn 20% of John’s earnings and 10% of Helen’s earnings. You can even as many referrals as you want! In order to get free trial thread, you has to verify your mobile number in the profile section under personal. Once you verify your mobile number, you should have got a trial thread. But if you have not received a trial thread then open a New Ticket with subject: “Trial”, Question : “Admin, I have confirmed my phone number, please activated my trial threads” and wait 2-3 days or you can buy a new thread. Hope you try this awesome new service helping researchers all over the world and also making money for yourself!